A week after Tim Yeo, the Chairman of the Commons Energy and Climate Change Committee (CECCC), made public his dissatisfaction with policy requiring homeowners to implement energy-saving measures throughout the home if they sought to built an extension or conservatory, Prime Minister David Cameron has intervened to scrap the new regulations. 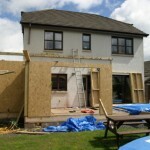 Due to come into effect as part of the Green Deal, the policy had aimed to encourage more property owners in Britain to improve domestic energy efficiency. Conserving energy while using less is necessary if the UK still intends to achieve its carbon-emission targets. The Green Deal was drafted with the aim of making it easier and more affordable for homeowners and landlords to install loft insulation,cavity wall insulation, double glazing, energy-efficient boilers and other green technologies. If Britain’s housing stock was less draughty, it was argued, far fewer carbon pollutants would be released into the atmosphere. Perhaps after taking notice of Mr Yeo’s comments, David Cameron has decided to put on hold mandatory rules imposed by the Green Deal. A government spokesperson explained: “The idea that people are going to be forced to improve their energy efficiency or install a new boiler because they want to extend their garage or make their house better is not going to happen. “It is not policy now. It is out for consultation, but the Prime Minister is opposed to it and it will not become policy. It is not fair to ordinary people trying to improve their homes”. The source added that Mr Cameron was committed to the Green Deal provided that it remained voluntary. The British Government must now consider new ways to encourage more households to improve energy efficiency, which is hardly a simple task in today’s economy. Far from being able to afford new boilers, insulation and solar panels, many homeowners are struggling to pay rising gas and electricity prices. Improving energy efficiency in the home is important, however. Liberal Democrat Andrew Stunell believes that households could save up to £150 a year by utilising aspects of the Green Deal. In January, Mr Stunell said: “A quarter of the carbon emissions produced each year comes from our homes, so it is vital we get to grips with energy efficiency to tackle this problem”.